JAZZ Workshops & Classes from 28 November to 1 December. The Cape Town Music Academy (CTMA), a not for profit company creating opportunities for contemporary musicians in the Western Cape, is hosting a series of FREE jazz workshops and master classes for music students and musicians in collaboration with UCT’s South African College of Music, at the end November (28 Nov – 1 Dec). The tutors who will be presenting the classes are some of the world’s best jazz educators and performers from South Africa, Germany and Mongolia. Joining the workshop from Germany, is the world class trumpeter and the Head of the Munich University of Music and Performing Arts Jazz Department, Professor Claus Reichstaller, and double bassist and Jazz Bass Lecturer, also at Munich University, Martin Zenker. Reichstaller, being a Big Band expert will be focusing on aspects of Big Band Playing, Phrasing, Improvisation, Breathing Techniques and Practice Routine. Zenker has also done innovative work in creating educational opportunities in Mongolia, and apart from his position at Munich University, is also the Head of the Jazz Department at the Mongolian State Conservatory for Music & Dance and is also the Project leader of the Goethe – Musiklabor in Ulan Bator. For his work, he has received the second highest honour from the Mongolian State in cultural achievement – “Seuljin Terguune Adjiltang”. Zenker will be teaching Harmonic Issues of Bass Playing, Repertoire, Memorizing Techniques and Stylistic Diversity. As one of Mongolia’s finest exports, and currently based at the Munich University of Music and Performing Arts, the exceptional jazz vocalist, Enji Erkhembayar will be presenting classes in jazz singing and the highly specialised Mongolian art of throat singing or “longsong”. 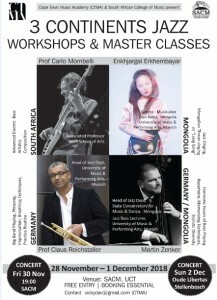 From South Africa, the brilliant composer and electric bass player, often regarded as a national treasure in his own right, Carlo Mombelli, originally self-taught and currently Associate Professor at WITS School of Performing Arts will be giving classes in advanced bass playing, artistry and composition. Two concerts will be held to showcase the talents of the participants and lecturers. The first is a smaller concert Friday evening, 30 November at SACM, UCT where participants of the workshops will also participate. Stephanie Vos of the Africa Open – Institute for Music, Research and Innovation will start the evening with a dialogue with Mombelli, Reichstaller, Zenker, Erkhembayar and the CTMA about their work. Entry for this concert is free, but booking is essential: contact samuel.kruger@uct.ac.za (SACM) or vickydav@gmail.com to book your seats. Then the series will conclude with an exclusive sunset concert on Sunday 2 December at the prestigious Oude Libertas Amphitheatre showcasing the talent of the four tutors with Mombelli taking the lead. In this show titled “Carlo Mombelli & 3 Continents Collective”, Mombelli performs music from his latest album with his stellar local band, featuring of Kyle Shepard (piano), Jonno Sweetman (drums) and Keenan Ahrends (guitar). They are joined by the three international guests to form the 3 Continents Collective – Claus Reichstaller (trumpet), Martin Zenker (double bass) and Enji Erkhembayar (vocals). Tickets for the Oude Libertas concert are available from Computicket.